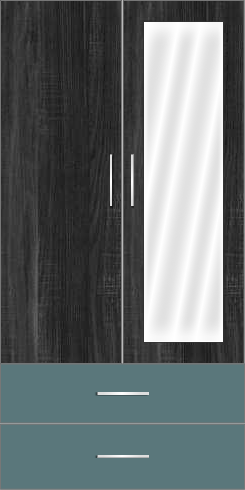 This wardrobe is designed to have a accentuated look with a grungy black wood finish along with drawers in Teal. The combination of wood finish and the high gloss finish gives a subtle grungy look. This wardrobe can go into the living room or dining area that we want to be colorful. Extra care should be taken when we plan to place this wardrobe in the bedroom or study rooms to make sure that it goes with the current theme of the rooms and the wall colors. Interior: Basic layout with a lot of removable full shevles to store books, cloth and even bigger things. The outer drawers can be used to store files, documents and medicine that are frequently accessed.The overall price of the wardrobe is subject to change depending on the laminate being used.